Messier 37 (M37) is an open cluster in the constellation Auriga. It has the designation NGC 2099 in the New General Catalogue. Messier 37 is the brightest, richest and largest of the three open clusters in this constellation that were catalogued by Messier. The cluster has an apparent magnitude of 6.2 and lies at a distance of 4,511 light years from Earth. Messier 37 can be found by first identifying the pentagon shape formed by the brightest stars in Auriga. The constellation lies in the northern sky, to the northeast of Taurus and northwest of Gemini. Capella, the sixth brightest star in the sky marks the northern point of the polygon. To the east of Capella is Menkalinan (Beta Aurigae) and to the south of Menkalinan is Mahasim (Theta Aurigae). M37 lies east of the midpoint of the line drawn from Mahasim to Alnath (El Nath) in Taurus, which lies to the southwest. Being the easternmost of the three Messier clusters in Auriga, M37 is the only one found outside Auriga‘s pentagon asterism. 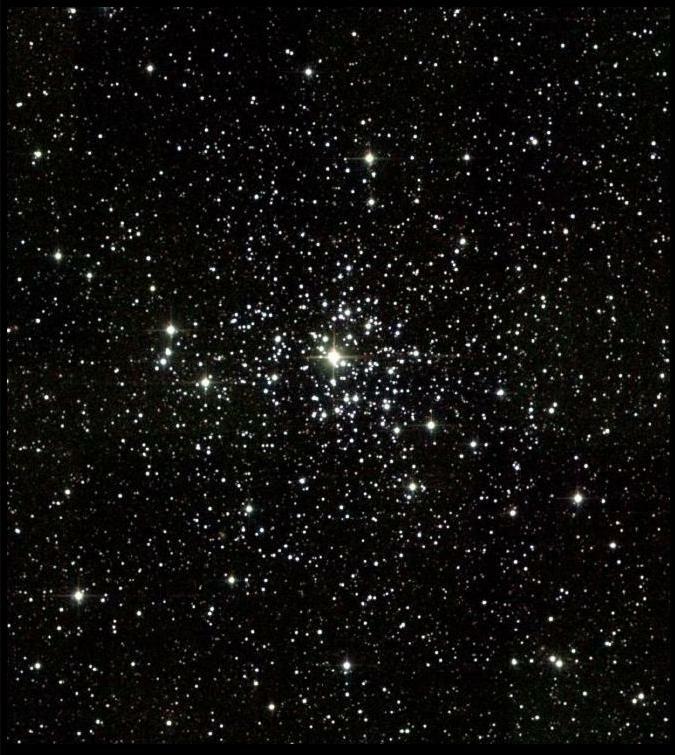 In 10×50 binoculars, M37 appears as a hazy patch of light, but 20×80 and larger binoculars reveal a very compact star cluster, resolving the brightest stars. Small telescopes will show a dozen brightest stars, while 8-inch and larger instruments reveal several hundred stars in the cluster. The best time of year to observe Messier 37 is in the months of December, January and February. Messier 37 lies in the direction opposite to the galactic centre when seen from Earth. It is between 347 and 550 million years old and contains at least 12 evolved red giant stars. The hottest main sequence star in the cluster has the stellar classification B9 V.
Messier 37 is classified as Trumpler type I, 1, r or 1,2 r, which means that it is a detached cluster with strong central concentration (I), that its stars either have almost the same apparent brightness (1) or a moderate range in brightness (2), and that ithe cluster is richly populated (r), with more than 100 members. Messier 37 contains more than 500 confirmed members, of which over 150 stars are brighter than magnitude 12.5. The cluster has a mass of 1,500 solar masses. It orbits through the Milky Way with a period of 219.3 million years, coming within 19,600 light years of the galactic centre at its nearest approach and moving to a distance of 30,700 light years at the farthest point in its orbit. The star cluster occupies an area of 24 arc minutes, which corresponds to a true extension of 20 to 25 light years. The tidal radius of M37, the area within which member stars are gravitationally bound to the cluster, is more than twice that value, 46 to 59 light years. Messier 37 was discovered by the Italian astronomer Giovanni Battista Hodierna before 1654. Guillaume Le Gentil missed the cluster when he discovered the nearby Messier 36 and Messier 38 independently in 1749, even though M37 is brighter and larger than the other two. 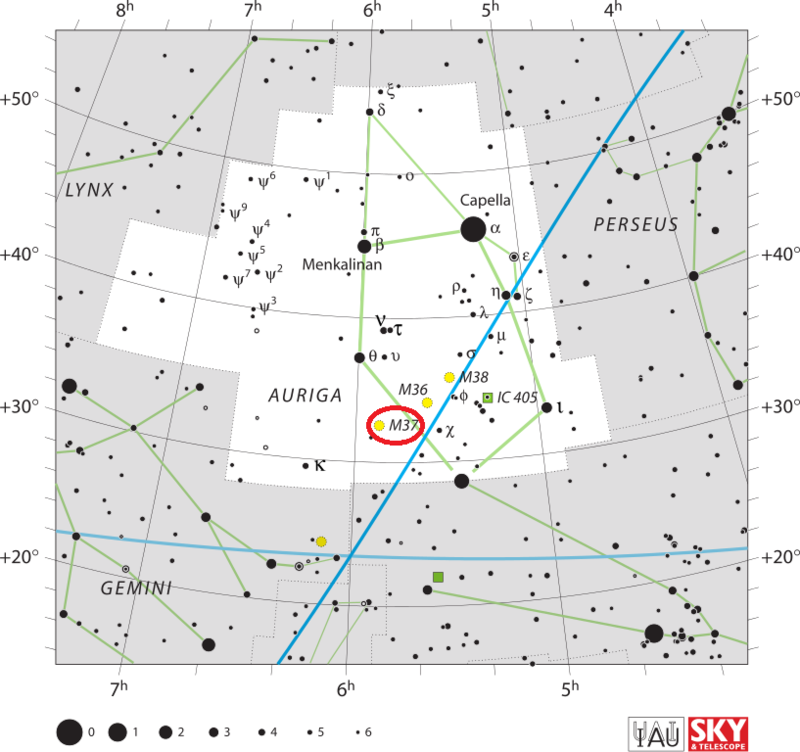 In the same night [September 2 to 3, 1764], I have observed a second cluster of small stars which were not very distant from the preceding, near the right leg of Auriga & on the parallel of the star Chi of that constellation: the stars there are smaller than that of the preceding cluster: they are also closer to each other, & contain a nebulosity. With an ordinary [non-achromatic] refractor of 3 feet & a half, one has difficulty to see these stars; but one distinguishes them with an instrument of greater effectivity. I have determined the position for this cluster, which may have an extension of 8 to 9 minutes of arc: its right ascension was 84d 15′ 12″, & its declination 32d 11′ 51″ north. On November 2, I discovered in Auriga, west and below the star Theta, a new nebulous star, which, observed through the 7-foot telescope, appeared as a vivid nebulous patch, in which no stars were recognizable, of uneven shape and slightly elongated in the north-south direction. Its distance from the star Theta is 4deg 58′ and from Nu 4deg 53′. Mr. 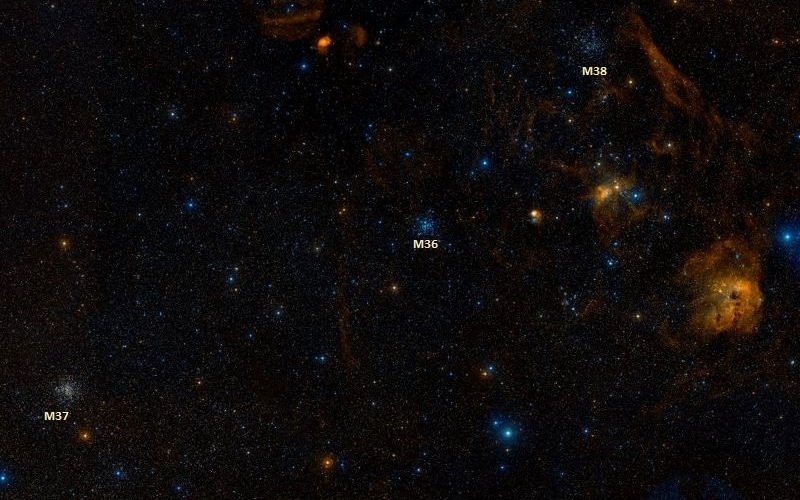 Le Gentil has discovered two new nebulous stars in Auriga (M36 and M38), which appear to the East of the previous as small clusters through telescopes. Around the new nebula there appeared many small stars in the 7-foot telescope, and chiefly it is situated in a position with the three brightest as shown in the 7th figure, where also the measured separations are shown. 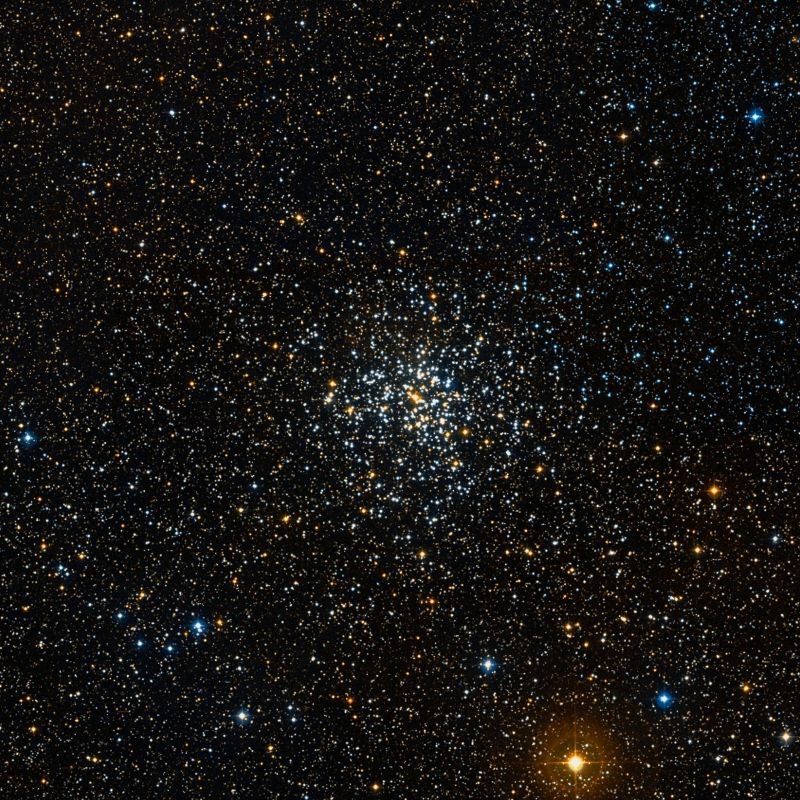 John Herschel catalogued the cluster as h 369 in 1827, describing it as a “very fine large cluster, all resolved into stars of 10th to 13th magnitude. It fills 1 1/2 field, but the straggling stars extend very far. There may be 500 stars.” Herschel later added the cluster to the General Catalogue as GC 1295. Messier 37. Atlas Image mosaic obtained as part of the Two Micron All Sky Survey (2MASS), a joint project of the University of Massachusetts and the Infrared Processing and Analysis Center/California Institute of Technology, funded by the National Aeronautics and Space Administration and the National Science Foundation. A double star in a cluster in front of Auriga‘s left shin. A and B, both 10th-magnitude, and pale yellow. A magnificient object, the whole field being strewed as it were with sparkling gold-dust; and the group is resolvable into about 500 stars, from the 10th to the 14th magnitudes, besides the outliers. It was found and fixed by Messier in 1764, who described it as “a mass of small stars, much enveloped in nebulous matter.” This nebulous matter, however, yields to my telescope, and resolves into infinitely minute points of lucid light, among the distinct little individuals. It is immediately preceded on the parallel by another small double star: and is about half a degree north east of 225 P. v., whose alineation is already described.